This practical, convenient and colourful steamer basket is made from high quality polypropylene, with self-adjusting sides to fit inside most pots. It also has a silicone knob and finger guard to help protect fingers when lifting the basket out of the pot. View more from Steamers & Poachers, Steamers , Joseph Joseph Prep Tools. It is a 100% improvement to what I used before. It is sturdy, does not fall apart, you can lift it out of the pot without burning your fingers. All in all really useful. 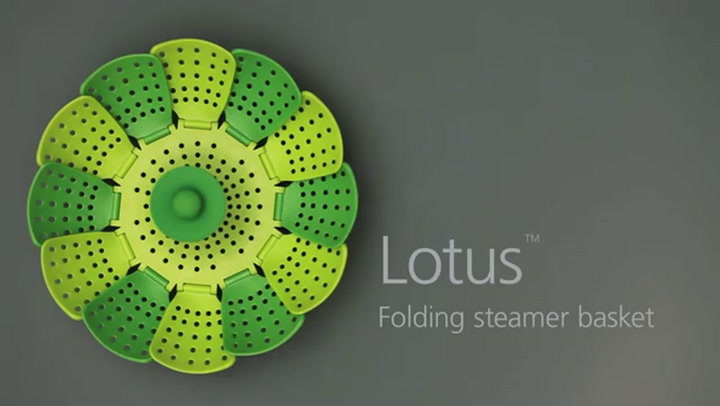 Excellent steamer, does the trick and very easy to clean! Folds up nicey to save space and easy to retrieve from the pot as the handle stays cool. Highly recommended. Sometimes the peas go missing between the lotus leaves - but with bigger vegetables it is an absolute must have. Easy to use and the centre handle piece doesn't retain the heat, you can lift it out of hot pot. Very easy and practical, I use it everytime I have to cook vegetables to keep all the flavor and the nutrients. When my previous one broke a leg ;) I had to rush to buy a new one... can't live without it ! !